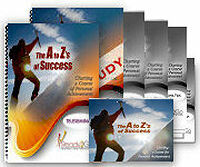 Special Report: The A to Z's of Success - Charting a Course of Personal Achievement from Ready2Go Marketing Solutions, Inc.
Six part Audio Training Program: "Top Secrets from the Industry Leaders on How to Conduct Impactful Workshops"
Two hour audio training course: How to effectively market your workshop for maximum attendance and results and learn workshop facilitation essentials. 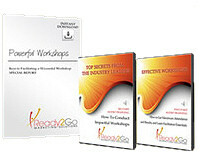 Special Report: "Keys to Facilitating a Successful Workshop"
PLUS you'll receive ongoing tips and information on how to grow your business using valuable tools that convert more prospects to clients! respect your privacy (see policy) and will never rent or sell your contact information. Note: Each webinar product gives you access to webinar/PowerPoint slides only, to be combined with teleseminars. Teleseminars are sold separately. Seven products bundled at a special price: Audio Training Program; Success Tips; Tweets; Special Report; PowerPoint Slides for Teleseminar; Teleseminar & Self-Study (same content/different format). To see a sample of this special report package, click here. Success. We ponder it. We desire it. We train for it. We work for it. We’re disappointed if we don’t have enough of it. Sometimes we even make ourselves physically or emotionally sick with stress in the pursuit of it. But what is success really? Is it Money? Fame? Material possessions? Happiness? Is it all or none of the above? In our culture success is inextricably linked with money, power, and fame. Whether the benchmark is the latest tech gadget, managing more people, more zeros on our paycheck, or a more impressive job title, we’re discovering that those old definitions of success are just that, old and outdated. Many of us adopt the idea of what we were taught in school or at home - that success is finding a good job, getting a raise, taking vacations, buying a nice car, getting married, buying a house, having children. While that may represent success to some, these days, there is no one-size-fits-all. We now have the freedom to customize our definition of success to our dreams and ideals. Now that we have seemingly unlimited options in defining success for ourselves, how do we do that? It may help to think of success as an event achieved through the process of personal development and mastery. In that case, a practical, day-to-day working definition of success would be described as, the favorable outcome of something attempted. That feels more manageable. Your clients will discover their personal definition of success, then use it to move steadily and sure-footed toward their goals, dreams, and the powerful, happy, fulfilled life they deserve. To see a sample of the special report, click here.